The 2013 edition of CCL started with a bang leaving all the excitement and thrills to be enjoyed by the millions of fans whom were keeping an eye on each moment of cricketing action. The Celebrity Cricket League Season 3 (CCL 3) which was started on 9th February 2013 at Kochi Jawaharlal Nehru Stadium has rose up to expectations with all teams putting professionalism to the game. The eight teams participating in CCL 3 are Chennai Rhinos, Telugu Warriors, Kerala Strikers, Veer Marathi, Karnataka Bulldozers, Mumbai Heroes, Bengal Tigers and Bhojpuri Dabanggs. Founded by Hyderabadi entrepreneur Vishnu Vardhan Induri, the Celebrity Cricket League (CCL) has grown beyond imagination with the league compatible with international matches organised by ICC. Started in 2011, the game had become much popular bringing the angels on earth to a single platform. Riding on the shoulders of the batting skill of Rajeev Pillai, Sumesh B and Vivek Gopan, Kerala Strikers do have a long line of bowlers who are able to turn down the match to their side. Led by Manoj Tiwari, the Bhojpuri Dabanggs has an array of players including A Ojha, U Tiwari and A Sharma who can hit the ball outside the stadium. So catch all the actions for the match to be played between Kerala Strikers and Bhojpuri Dabanggs. Manoj Tiwari (c), Dinesh Lal Yadav (vc), Ravi Kishen, Vikash Singh, Akbar, Surya, Vikrant Singh, Pravesh Lal Yadav, Ajhoy Sharma, Uday Tiwari, Abhay Sinha, Pawan Singh, prakash Jaish, Ayaj Khan, Aditya Ojha, Sushil Singh, Akash Mukhergee, Kesari Lal Yadav, Santosh Srivastav, Ajay Srivastav, Jay yadav, Saliesh Sinha, Sudhir Singh and Anil Samrat. 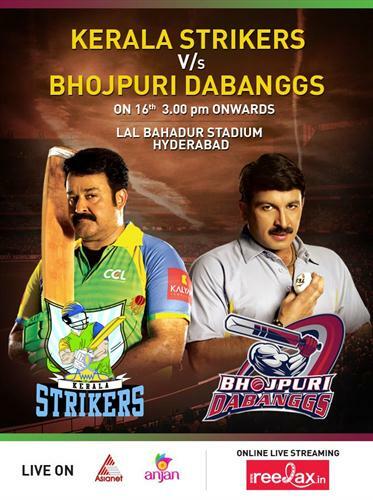 The CCL T20 match between Kerala strikers and Bhojpuri Dabanggs to be played at Lal Bahadur Shastri Stadium Hyderabad will be telecast live on channels like Asianet and Anjan on 16th February 2013 from 3.00 pm onwards. If you are out of home and want to enjoy the excitement and thrills, don't miss to watch the match live streaming online on http://reelax.in/live.